Dr. Jacob Bleacher is a Planetary Geologist working at NASA Goddard Space Flight Center. 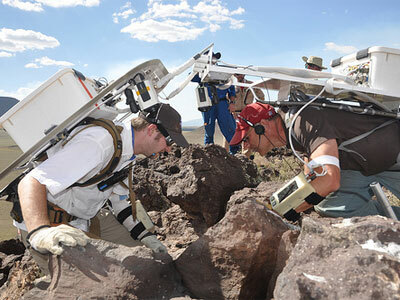 For the 2010 Desert RATS field test, Dr. Bleacher was the geology crew member on rover B during week one. During “Lead and Trail” operations, both rovers and crew operated in close proximity to each other, often exploring similar geologic terrains. In general, the rovers maintained line of sight, but most important was maintaining communications during these operations. If line of sight and communications were lost for a period of time, both rovers were required to return to the last location in which they had communication with the other rover. In general, this resulted in the rovers being no farther apart than 1-2 km. 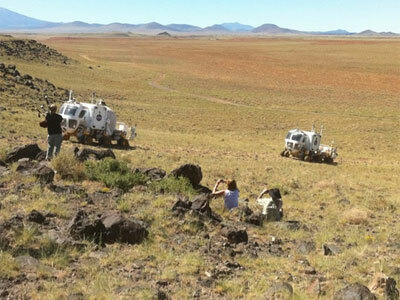 During “Divide and Conquer” operations, both rovers were free to explore different geologic terrains without maintaining line of sight or as strict communications. This enabled both crews to cover more ground as a team, but should something go wrong, they would be farther apart from each other and less able to help each other out of trouble. The two communications scenarios that we tested were called “Two-a-day Comms.” and “Continuous Comms.” Together, these two scenarios represent the opposite extremes of how we might set up our communications capabilities for future missions. During “Two-a-day Comms,” the crew were not in communication with the science backroom or Mission Control during the day. Crew were responsible for making sure that they arrived to predetermined sites, at which our communications hardware would enable us to touch base with the backrooms. As we slept in the rover overnight, the backrooms would work to download all of the data that we had collected the day before. At the beginning and end of each day, while we were still in communication with the backrooms, we would have meetings to discuss what we had seen during the day, and what the plan was for the new day. During “Continuous Comms,” the crew were able to communicate directly with both Mission Control and the science team at all times. This enabled the science team to keep track of what we had done all day, and took some pressure off of them while working through the night to interpret all of our data. As you might suspect, each scenario resulted in slightly different outcomes. As we have read already, the Human Factors team was tasked with keeping track of how the crew physically responded to the work environment, which is strongly influenced by these different scenarios. Meanwhile, the Science Team was keeping close track of which combination of scenarios provided the greatest science value. Now that the test is over, it’s time for the team to evaluate what the outcome was of these different scenarios. Each scenario will also need to be balanced against the cost it takes to make it happen. So, which one was best? What do you think? Stay tuned. You might very well see the answer to that question in the way that our future missions are designed to send humans to the moon and other planets. And you can say you saw it all unfolding when you kept track of the Desert RATS and other NASA Analog Field Tests. Space Exploration Vehicles A and B come home at the end of the Desert RATS mission. 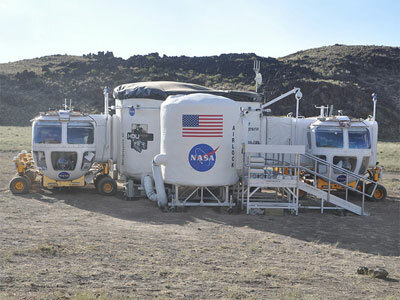 Author NASA Testing for Human Space ExplorationPosted on September 15, 2010 March 19, 2013 Categories UncategorizedTags Analogs, Desert Research and Technology Studies (RATS), field testing, General3 Comments on Desert RATS: What now? One of the great advantages of the Space Exploration Vehicle (SEV) is the ability for the crew to return to a “shirt sleeve” environment (like your living room) inside the rover, to relax between Extra-Vehicular Activities (EVAs). In an earlier blog, Dr. Rice mentioned that the Apollo J-Missions (15-17) brought along a rover. 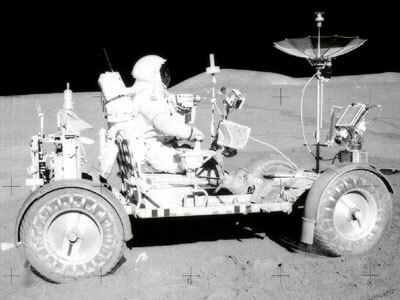 This rover enabled their crew to cover much more ground than the earlier Apollo missions and was a great advance for human exploration of another solar system surface. However, the Apollo rover was unpressurized, meaning the crew needed to be in their spacesuits for the entire time, as they roved the lunar surface. During the J-Missions, crew members were in their pressurized suits for up to 8 hours a day for 3 days of exploration. Operating in a pressurized suit is difficult and can be painful. It is manageable for a short period of time. Future missions to explore the solar system with humans may be longer duration missions, such as 7, 14, 30 days or even longer. If crew members were to use an unpressurized rover for missions of this length, they would be forced to wear their pressurized suits for much longer periods of time than their Apollo forefathers. As I mentioned before, the suitports help us to keep dust out of the rover. They also give the crew a break between EVAs so they do not feel as much discomfort or exhaustion as a result of wearing pressurized suits all day, every day, during a mission. As Dr. Robert Howard reported in his blog, the human factors team is monitoring how tired we become during EVAs and how quickly we can recover while resting inside the rover. During my week in rover Bravo, we went on one EVA for almost 3 hours, as did the crew of Rover Alpha. In the second week, one crew went on two EVAs in one day that were just as long. I can say, that at the end of my long EVA, I was very happy to return to the rover. After using the suitport to enter the SEV, I was able to change out of my dirty field shirt and into a clean t-shirt. I was able to stretch out without a heavy backpack on and I even stood in front of the air conditioning vents for a few minutes to help me cool off. Although we don’t have much time to “relax” after an EVA (because we need to head to our next site), it is much more comfortable to sit in a clean t-shirt without a backpack on while navigating and driving (and even eating a snack). Due to the ability to take a break between EVAs, the SEV and its suitports make it reasonable for us to plan missions of a month or more, without causing the crew to suffer from exhaustion. Astronaut David Scott must wear a spacesuit while driving the unpressurized lunar rover on the Apollo 15 mission. Dr. Jacob Bleacher and the other crew members can work in shirt-sleeves inside the Space Exploration Vehicle. Dr. Jim Rice is an Astrogeologist working at NASA Goddard Space Flight Center. For the 2010 Desert Rats field test, Dr. Rice will be the geology crew member on rover A in week one, as well as a member of the science backroom for week 2. Our field site here in northern Arizona allows one to contemplate our human origins and destiny in a very unique way. Now, allow me to explain. The Black Point Lava Flow, where Chris and I started our 7-day mission in Rover Alpha, is 2 million years old. 2 million years is an interesting number in terms of human origins. 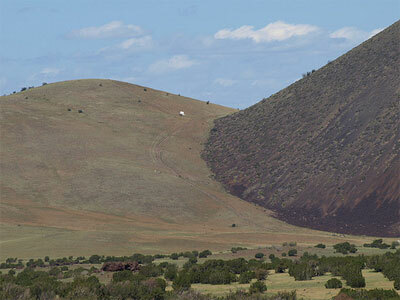 While the Black Point Lava Flow was being born and flowing as a river of molten rock and fire, our early ancestors, Homo Erectus, were learning to fashion tools out of rock (some were made of basalt – the very same rock type that is at Black Point) and harness fire for the first time in Africa, the cradle of mankind. This date of 2 million years ago also records the first migration of our ancient ancestors out of Africa and into what is now Europe and Asia. Now, moving on to another prominent lava flow for this year’s field test, we come to the lava flow from SP Mountain. This flow is 70,000 years old and while this eruption was taking place, halfway around the globe a much larger massive super volcanic eruption was occurring at Toba, in what is present-day Indonesia. This was one of the largest eruptions known in the geologic record. Its prestigious amounts of ash combined with an already present Ice Age contributed to further cooling the planet down. At the same time, the human population had decreased to a dangerously low level of between only 1,000 to 10,000 people worldwide. Modern humans at this time started another mass migration out of Africa that eventually led to the spread of humans across the whole globe that we recognize today. Flash forward to today, where we are now conducting a manned Planetary Rover field test. It is also interesting to note that the earliest human footprints are recorded and preserved in a layer of volcanic ash, and the Apollo astronauts’ bootprints are also preserved in the volcanic plains of the moon (see photos below). The human race is now on the brink of another major migration – this time it is into the cosmos. I have no doubt that Desert RATS with everyone’s hard labor and long hours is setting the stage for this, the greatest of all human migrations out among the stars. 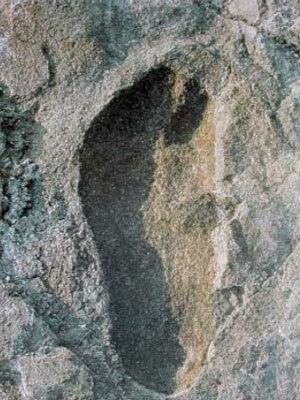 Photo of the earliest human footprint recorded in volcanic ash. 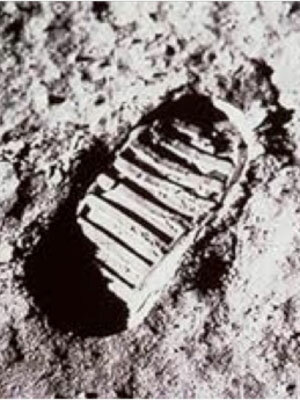 Photo of the first human footprint in lunar soil. Kelsey Young is a geologist in the School of Earth and Space Exploration at Arizona State University and supporting Desert RATS as a member of the science backroom and as one of the geologist crew members. Seven days in Space Exploration Vehicle (SEV) B. I am conducting a thorough exploration of a volcanic terrain in a concept space vehicle with one other person (in my case, Astronaut Stephanie Wilson). Sound straightforward? While I’m a field geologist who has spent a lot of time in the outdoors, I’ve not been trained to live in a confined space for seven straight days. Cooking, sleeping, going to the bathroom, and cleaning, take on a whole new meaning. They all happen in a very small space. My bed is also the storage location for my food, in addition to the surface where I prepare my meals. In preparing for this field test, and completing the first three days, I’ve been surprised to realize how easy it is to live comfortably in SEV B. The biggest thing I’ve learned while spending the last three days in the rover, is establishing a set of routines to use for each daily task. It takes several minutes for the hot water for cooking to heat up, and in that time I clean my bed and eating surface (typically my seat in the front of the rover). For food we eat dehydrated pastas and meats that have to be cooked for 10 minutes with hot water. We also have iced tea, lemonade, and fruit punch mixes that we can drink, and instant coffee for the mornings. Each person has their own sleep station that affords a lot of privacy, and we each have a set of soft lockers where we can store our clothes and personal items. Considering we’re living in a prototype space vehicle, it’s been a comfortable stay! SEV B has become my home away from home, and I’ll say a fond farewell at the end of Day 7. 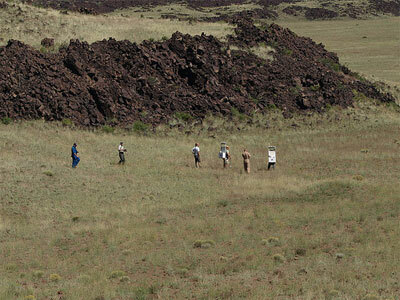 Crew members and test team hike toward a designated exploration site on Mission Day 11. The Space Exploration Vehicle viewed from a distance, a small white dot against the landscape. José Hurtado is a geologist, teaching at the University of Texas at El Paso (UTEP). During Desert RATS 2010 he is working in the science back room in week one, and on Space Exploration Vehicle A as the geology crew member in week two. My name is José Hurtado, and, while I am a geologist and professor in my normal job, for the past three days I am one of two crewmembers on board a prototype planetary rover called the Space Exploration Vehicle (SEV). 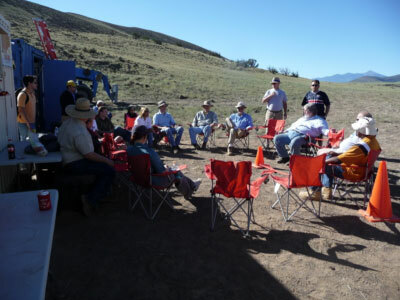 I’m supporting a week-long mission simulation in the Arizona desert north of Flagstaff that is part of a NASA field test called Desert RATS (Research and Technology Studies). The test has the overall goal of figuring out how to use the SEV for studying geology on another planet. 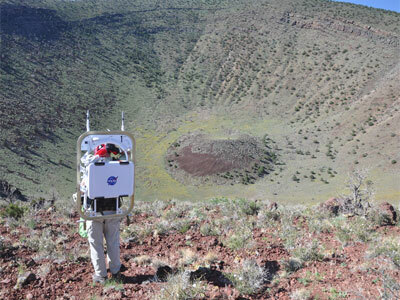 We are doing this in the San Francisco volcanic field, a cluster of volcanoes that have erupted over the past 3 million years and are similar to the types of terrain and geology we hope to someday explore on the surface of the moon or Mars. Our mission is to make observations and to collect samples to help unravel the history of volcanic eruptions in the area. Our main tool for doing this is the rover itself, which is an incredible machine for fieldwork. In addition to being able to climb over steep, rough terrain, it also has an array of cameras and a bubble window that allow us to get detailed views of the surroundings. It serves as our mobile home and base of operations for performing EVAs (“extravehicular activities”), or spacewalks to make detailed observations. During our EVAs we wear backpacks that simulate the spacesuits astronauts would wear when exploring outside their SEV. The backpacks also have video cameras we can use to share our findings with our colleagues on the science team in “mission control”. Other tools we use are familiar to geologists, including a rock hammer, shovel, tongs, core tubes, and sample bags. We use these to take rock, soil, and sediment samples to bring back to a prototype GeoLab facility at base camp. The GeoLab allows us to make basic observations about the texture and structure of the samples with a microscope and mineral and elemental composition of our samples with an X-ray Fluorescence (XRF) spectrometer. I have three more days left in my mission before we arrive at base camp for a day of work in the GeoLab. It has been a productive and fun mission so far, and I’m happy to have the opportunity to help NASA plan for future planetary exploration missions! 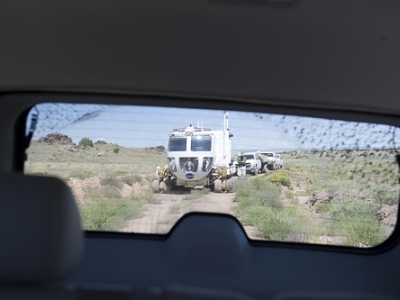 The caravan with Space Exploration Vehicles (SEVs) also includes chase vehicles with scientists and others supporting mission operations teams. 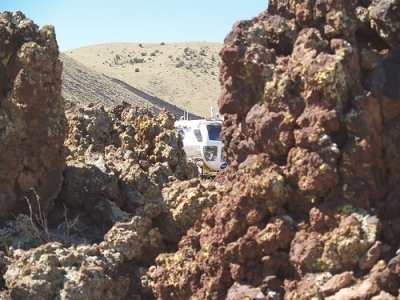 The Space Exploration Vehicle (SEV) moving along the trail is captured on camera from behind rock formations. Dr. Jacob Bleacher is a Planetary Geologist working at NASA Goddard Space Flight Center. 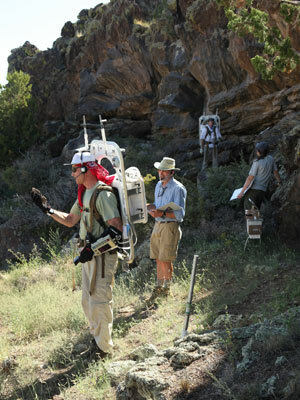 For the 2010 Desert RATS field test, Dr. Bleacher is the geology crew member on rover B during week one. I am a geologist who studies lava flows on the Earth, moon, and Mars. To do so, I conduct field work on lava flows here on the Earth for comparison with other planets. The Space Exploration Vehicle (SEV) is a tremendous asset for conducting field geology in extreme environments. Unlike Apollo, where the crew needed to return to the Lander at the end of each day, we use the SEV to travel from a site of geologic interest to another site of geologic interest, without being forced to return to a common location every night. As such, we carry the most important geologic tool with us, the geologist. To support the geologist, the rover has a bevy of tools. Once we reach an exciting site, and our commander has picked a safe location to park, we begin by recording a voice note to tell the science team what our plan is for exploring the area. This note is supported by video and images taken from cameras mounted on masts above the rover. After providing an overview to the science team, they are given control of the cameras to track our progress outside of the rover. At this point, we move to the back of the rover, where the suitports are located, and begin our Extra-Vehicular Activity or EVA. The suitports are a new design allowing us to climb into the suit through its backpack. The process keeps the suit and the dust that sticks to it on the outside of the rover. Once outside, we collect the tools that we will need to complete our objectives for the site. We have a standard geologist hammer, shovels, core tube (to collect soils without disturbing their layers), and sample bags. We also have two cameras mounted on our backpacks. We use the cameras to show the scientists at base camp the rocks and samples we are collecting. With the cameras, we record notes for the science team. Our field notes describe sample characteristics and its relationship to other samples. The cameras provide audio, video, and high definition images that help us document what we have done. After we collect samples, we weigh them and store them in a locker on the aft (back deck of the rover.) The aft is where the samples are stored until we meet up with the Pressurized Excursion Module or PEM. Our SEV docks to the PEM. The PEM is a large habitat housing tools and equipment we use to repair our suits or hardware. In the habitat we also have medical equipment and a geology work station. The geology workstation has laboratory instruments we use to study exciting samples in more detail. This is how we will use the SEVs to explore the geology of another planet or the moon. Geologists Dr. Jacob Bleacher (left) and Dr. Jim Rice (right) take a closer look before collecting samples. 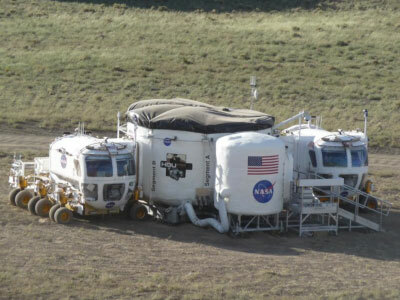 Space Exploration Vehicle rovers A & B connected to the Pressurized Excursion Module (PEM). Scott Bleisath is leading a team of engineers from NASA Glenn Research Center (GRC), who are developing electronics and displays for NASA’s next generation of astronaut space suits. The Extravehicular Activity (EVA) Power, Avionics, and Software team at NASA’s Glenn Research Center (Cleveland, Ohio) are proud to be participating in Desert RATS 2010. As part of NASA’s space suit engineering team, our role is to develop a suite of electronic tools and applications that will help future spacewalking astronauts work efficiently and autonomously. 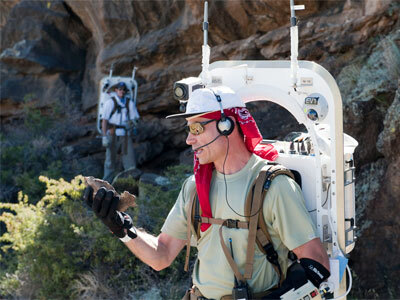 For Desert RATS 2010, we are testing a prototype EVA Information System (EVAIS). This electronic system is carried inside the astronaut backpacks, used during the daily EVA (spacewalk) excursions performed by the rover crews. The EVAIS works along with a small flat-panel computer display on the astronaut’s wrist, called a cuff display, and a High Definition (HD) video camera mounted on the backpack. › Learn more about this technology: Watch the NASA EDGE webcast on Friday, Sept. 10, 2010 at 1 pm EDT, featuring an EVAIS engineer! The EVAIS and cuff display stores and displays timelines, procedures, and maps to the Desert RATS crewmembers. For an astronaut performing a spacewalk, providing access to this type of information is very important. For any exploration space mission beyond Earth orbit, such as missions to the Moon, near Earth asteroids, or Mars, communication with flight controllers on Earth may not be available or may be significantly delayed. 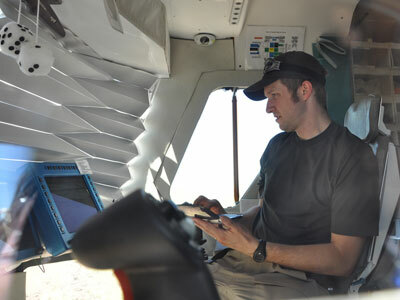 The EVAIS enables the crew to manage their activities autonomously. At Desert RATS, we are learning what is the correct type and amount of information needed by an EVA crewmember. Any electronics going on a spacesuit has to be very efficient from a size, weight, and power perspective. So, we cannot afford to have any “bells and whistles.” Our team spent over a year talking to astronauts and other stakeholders to understand their needs and expectations for our system. They made it clear to us that we cannot bog the crew down with too much information, because that would hinder operations, rather than help. In addition to displaying information, the EVAIS allows an EVA crewmember to record snapshots and Crew Field Notes (CFNs) with an HD video camera. For geologists, much of the data that they gather, when working out in the field, is their verbal observations being dictated into a tape recorder. Using buttons on the cuff display, the astronaut can activate the camera and built-in recorder to record CFNs. 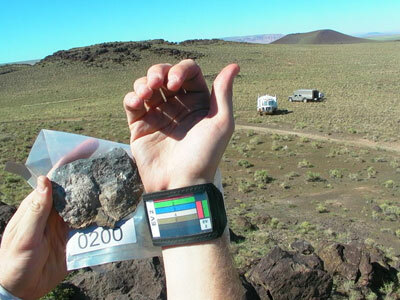 So, the crewmember can gather a rock sample, hold it up in front of the camera, and provide a verbal description. The CFNs are stored on the EVAIS and at the end of the day, they are sent to the science-support team on the ground to analyze. As the 14-day mission for Desert RATS 2010 is nearing completion, our team is very pleased with the results that we have seen so far. Our system has held up well to the rigorous desert environment. It has been a lot of fun to see our system in use and see how much the science-support team appreciates the geologic data recorded by the EVAIS. We are already thinking about improvements we can make in Desert RATS 2011. Astronaut Stan Love (foreground left) holds up a sample rock, while recording a Crew Field Note during an EVA. A cuff display can be seen on his left arm. This is an example snap-shot image recorded by the EVA Information System. The image was recorded by Desert RATS crewmember Jake Bleacher. The color chart worn on his wrist helps geologists analyze the rock sample. Space Exploration Vehicle Rover B can be seen in the background. Dr. Stanley G. Love is a NASA Astronaut. He completed his first spaceflight on the crew of STS-122, logging over 306 hours in space, including over 15 Extra-Vehicular Activity (EVA) hours in two spacewalks. I’ve finished my tour of duty aboard Rover B for the first week of Desert RATS, and returned home to Houston. The mission was very busy, but now there’s time to reflect on the experience and write about it. Although we were rolling across plains of waving grass with yellow flowers under sunny blue skies, the rover journey was surprisingly similar to the experience I had flying in space on Space Shuttle mission STS-122. The living quarters were small, the preserved food was very much like the menu aboard the Space Shuttle, and the flow of each day’s carefully scripted and timelined operations was familiar. There were differences, of course: getting ready for a walk outside took minutes instead of hours, and the backpack we wore to simulate a space suit weighed 35 pounds, not 350! Another difference between D-RATS and a space mission is that a simulation on Earth has some room for fun. So the fuzzy dice we hung from the front cockpit ceiling of Rover B were thought to be amusing rather than unprofessional, and the cow skull we zip-tied to the roof was hilarious instead of an embarrassment. Like a space mission, however, the hallmark of the D-RATS experience is serious work. Our crew work days were fifteen hours long. We had no time to watch the DVDs we’d brought for evening entertainment. We kept a constant eye on the clock, with miles of slow driving and three geological sampling EVAs to complete before the hard deadline at the end of each day. We also kept very busy balancing the engineering and human-factors testing of the rover with the scientific goals of the expedition. D-RATS is still running. We won’t find out until afterward how well it went and how much we learned from it. But it was a great experience and I hope they invite me back next year! Astronaut Stan Love in the foreground of an amazing view of a crater during Mission Day 5. Astronaut Stan Love talks to scientists at base camp and describes one of the rocks he finds on Mission Day 6. Dean Eppler is the D-RATS Science Lead. So, we’re into Week 2 – new crew, new mission, and about a third of the science team is new members replacing folks that have to go home. The first week of operations went very well; although the first day of operations was hectic, with a lot of things that didn’t start up as well as we would like, the team pulled together and the problems were quickly fixed. By the second day, we were all operating as smoothly as if we had working together for months. The second week started off with a day of bad weather – steady rain, winds and low hanging clouds – definitely not weather for space operations. Initially, it was hoped that we would be able to conduct our operations in the afternoon, so each rover science team took a hard look at the planned traverse for the day and figured out how it could be replanned to take into account the limited operations and still get our science objectives done. It was a good exercise – the fact is that while we would like every mission to go exactly as planned, the real world rarely allows that, and a key capability is the ease of replanning. In the months prior to coming to Flagstaff, the traverse planners were careful to use the science objectives of the field operation to prioritize each station. Consequently, we were able to re-plan the operations for the day in about an hour, and have a new plan ready to go. In the end, although the weather cleared up a bit late in the morning, the National Weather Services in Flagstaff warned us that the good weather wouldn’t last, so the Mission Management Team scrubbed the activity at about 11:30 a.m. Last night, after a discussion with the Mission Management Team, the Strategic Science Operations Team did a hard look at the constraints we have on the rest of the mission, and began replanning the last 5 days. This morning, we’re initiating the first part of that replan, which is starting with the stations we missed yesterday. As the days go on, we’ll be continue to implement that new plan so we arrive back at our Base Camp by noon on Day 14. The ATHLETE rover and Habitat Demonstration Unit ready for a day of operations. Tracy Gill is on the management team of the Habitat Demonstration Unit (HDU) project, which brings together a multi-center team of NASA architects, scientists and engineers, working together to develop sustainable living quarters, workspaces, and laboratories for next-generation space missions. 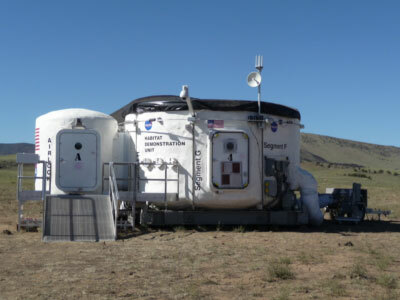 When we last left our intrepid readers on August 30, we told you about getting the Habitat Demonstration Unit-Pressurized Excursion Module (HDU-PEM) configuration assembled and tested in Houston and then packed up to ship to Arizona. Since then, plenty has happened. We had a couple of issues in transporting hardware to Arizona including some elements that were damaged on the bumpy roads that led to our test site and one support vehicle that broke down in Amarillo, Texas that will now arrive about two weeks late. Nonetheless, we have persevered through heat, wind, dust, dust, more dust, and even a little rain to get the HDU-PEM up and running to support Desert Research and Technology Studies (D-RATS) 2010 at SP Mountain in Arizona. The HDU PEM ready for operations with SP Mountain just visible in the background. At SP Mountain, the HDU-PEM team is set up about 14 miles via paved and dirt roads from the main D-RATS base camp at Black Point Lava Flow. So our skeleton crew at SP Mountain had to put forth a tremendous effort in just a few days to unload, assemble, test, and solve problems to be ready for the dry run and then test operations. As someone used to working in clean rooms and control rooms and meeting in conference rooms for pre-test briefings, I found that holding daily pre-test briefings literally in the field was definitely different. Pre-test briefing HDU-PEM-style in the field in Arizona. The Space Exploration Vehicle (SEV) rover crews docked with the HDU-PEM to perform geologic science and other activities at SP Mountain on Day 7 and will dock again at Black Point Lava Flow on Day 14 of the 14-day traverse mission of D-RATS 2010. So that means we have to pack, assemble, and deploy twice during the D-RATS campaign to simulate a mobile asset available for excursions from an exploration base. While the SEV rover crews are only performing joint operations with the HDU-PEM on two mission days, on the other days, we are performing independent test activities using operators such as geologists, engineers, interns, and others. And our human factors experts assess the performance data to help us assess the utility and effectiveness of the technologies, systems, and the operations inside the HDU-PEM. 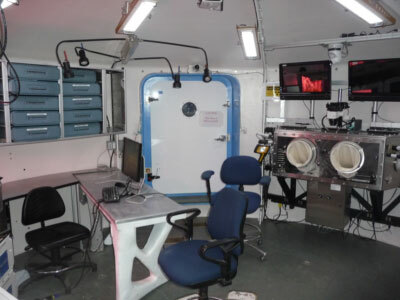 Two of the four workstations inside the HDU-PEM: The Medical Operations Workstation (left) featuring a dual purpose work surface and patient table and the Geolab featuring a Glovebox. One of the major milestones of the D-RATS 2010 occurred at the end of Mission Day 6 when the two SEV Rovers docked with the HDU-PEM. It made for a great picture as you can see, and our team was quite proud to see our systems being featured on Day 7 of the rover crew’s timeline. 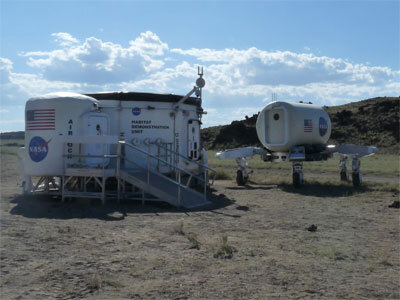 Space Exploration Vehicle Rovers A and B docked to the HDU-PEM on September 5, 2010 near SP Mountain.